click here to view the entire collection of paintings in this exhibition. This show is my first in my new home. It’s also my first major exhibition since my husband Greg passed away 4 years ago. 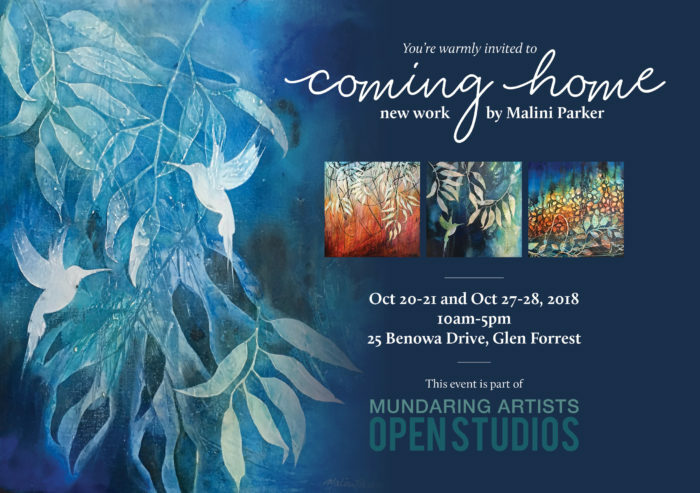 It’s been a long and surprising journey finding myself here, almost back at the beginning – my first exhibition EVER was also held in the hills, just around the corner at my sister’s garden, 13 years ago! In COMING HOME, it seems I’ve come full circle. I named this exhibition COMING HOME for all of these reasons, but there are also two others, and they both point to the mysterious workings of the Universe. When I first walked into this house in December last year, I had already seen 18 houses that I didn’t like. As soon as I entered this one, I noticed 3 paintings on the wall that looked familiar. They were. They were actually painted by me, 12 years ago, and purchased by the then owner of this house. We had never met. I didn’t know her. But for 12 years, my art hung in her home. And then it became my home. The second reason is one that goes very deep. As many of us have, I’ve seen a fair bit of adversity in my life. My own chronic, debilitating illness, my daughter’s challenges with mental and physical health, my beloved husband’s 4 year battle with cancer and his passing after 28 years together. And then I’ve had the past four years of rebuilding my life and my identity without him. Through it all, I’ve witnessed firsthand the gifts that come with adversity. The courage and determination of my daughter. The indomitable faith of my husband. The immeasurable kindness of others as they supported us through our challenges. My own growth, as I struggled to survive. It’s no coincidence that my art is filled with themes of fire and growth, darkness and light. I’ve used the indefinable magic of the creative process along with faith in an ultimately benevolent Universe to get me through – to “come home” to myself, to my own faith and strength, even when at times, faith and strength were only a tiny glimmer in my heart. Fire and Light. Chaos and Growth. Despair and Hope. These are the themes of my art, and the themes of my life. I hope you find joy in my work!